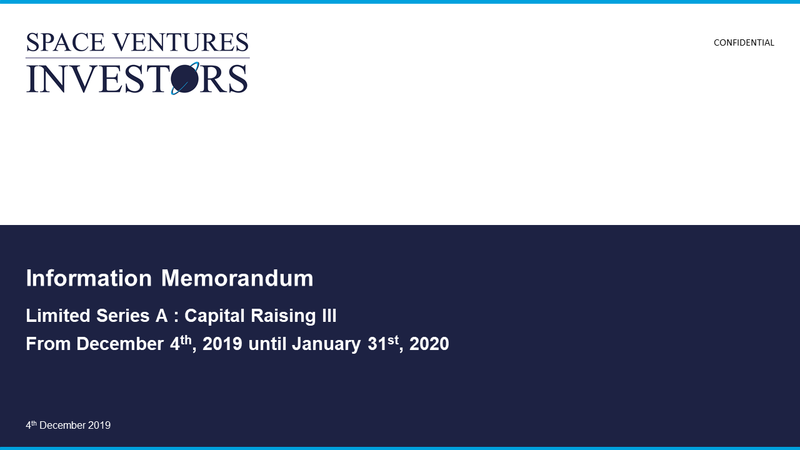 Space Ventures Investors Limited (SVI) is raising capital from early investors from March 25th until May 31st 2019. ‣ Individuals: Investors (they may have to be Accredited Investors relative to their jurisdiction) who want to invest in a space-related business, and people who have worked in finance. ‣ Corporations: Commercial entities who want a strategic investment in space commerce. ‣ Venture Capital: International VCs that want a strategic investment in space commerce, including downstream space-start-ups. Note: This is not an offer of public shares. All potential shareholders will be subject to internal Due Diligence, and the sign-up process is in accordance with the United Kingdom's Financial Conduct Authority. Space Ventures Investors Limited is a private company, is incorporated in the UK, and is owned by co-founders and shareholders. To find out more and to receive a Short Presentation, you must fill in the form below. By filling in the form below, you agree to be contacted by Space Ventures Investors Ltd.